Dustin Heuer is a 1995 Hanover graduate. His first full-time coaching job came in Crete (Neb.) High School, approximately 60 miles away from his hometown. Heuer served as assistant coach from 2000-12 before he decided to take over Marysville High School, located just 20 miles from Hanover. Marysville was a state runner-up in ’09 and reached the postseason again in ’10 before falling on hard times. The Bulldogs suffered a winless season in 2012 before Heuer arrived. Marysville then posted 0-9 marks in Heuer’s first two seasons, ’13 and ’14. Entering 2015, the Bulldogs were on a 32-game losing streak. However, Marysville has quickly turned around and vaulted up the Class 3A rankings. In the ’15 season opener, Heuer earned his first victory with a 35-19 win against St. Marys. Marysville finished 4-6 in ’15 and 7-3 last year that featured its losses by a combined 17 points. On Friday, Marysville rolled at Rossville, 52-13, the three-time defending Class 3A state champions. The Bulldogs, who lost 27-20 to Rossville last season, led 36-7 at the end of the first half. After the win, Marysville is now fifth in 3A. Heuer said he “really didn’t expect” the large margin to occur. One of Heuer’s questions regarded physical play, and he was pleased with the effort. Senior quarterback Jack Blumer, a first team all-North Central Kansas League selection, completed 15 of 17 passes for 316 yards and six passing scores. He rushed for one TD. Senior wide receiver Gabe Pieschl caught six balls for 192 yards and four touchdown passes. While many teams, including highly ranked squads, struggled with turnovers and penalties, Marysville had just one turnover and only 30 penalty yards, half of Rossville’s total. Heuer said he “put a lot of stress on” eliminating controllable mistakes. Heuer said Marysville had struggled some with those in practice and preseason scrimmage. “They are all really competitive, and what I saw Friday was a group of guys who really locked in,” Heuer said. This week, Marysville plays host to Abilene, which defeated the Bulldogs, 14-12, last season in league play. Abilene is 5-0 in the NCKL each of the last three years. The Bulldogs last won a conference title in ’08. Marysville has lost eight in a row versus Abilene. Heuer discusses two goals each year: conference and district champions. In 2014, 23 Kansas teams finished without a victory, according to Prep Power Index archives. Of the 20 that still play KSHSAA football this year, Marysville leads all those squads with 12 victories and a pair of playoff berths. Sterling (11 wins) is the only other one of those ‘14 winless teams who has more than seven victories since the start of ’15. Heuer, the brother of Hanover football coach Matt Heuer, was aware Marysville had plenty of athletes when he took over. The Bulldogs are traditionally a strong 3-2-1A wrestling program and won the Class 3A basketball crown last winter. 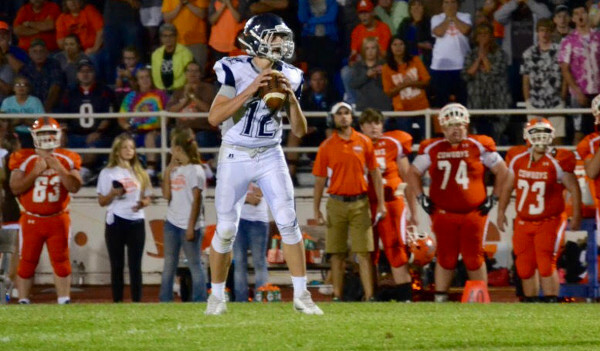 Like Friday, Blumer was a very efficient quarterback last fall. He easily led the NCKL in completions (87), attempts (148), completion percentage (58.8), yards (1,372) and touchdowns (16) with just six interceptions, according to NCKL statistician Kevin Johnson. Pieschl and senior Seth Mooradian are the lone current players who have started since before ’16. The 6-foot-3 Pieschl, the Class 3A basketball player of the year, led the team in receiving as a sophomore. Last fall, opponents focused on him more and he finished with eight catches for 196 yards and a TD. This year, Marysville has more depth at receiver. “I think it makes it really tough to double cover him with anybody, so I think we get kids in a lot of 1-on-1 situations,” Heuer said. Marysville permitted just 11.5 points and 162 total yards a contest last year, including just 90 yards on the ground in a run-heavy league. In ’15, the Bulldogs permitted 141 on the ground, 113 a game in the air and 20.9 points a game. Marysville replaced its top-six tacklers from 2016. Heuer called Bryson Meinhardt, a returning senior offensive lineman/linebacker, the defense’s heart and soul. Last fall, Meinhardt was a skill player and moved down to the offensive line when Marysville needed players up front. The linebacking corps is more inexperienced than ’16. “Probably more athletic than last year,” Heuer said of the group. Crete normally ran a 5-3 defense in Heuer’s tenure. Crete didn’t see a lot of spread looks. In Kansas, the 3-4 look is more effective against the spread. “It was Cornhusker land, and everybody wanted to pound the football,” Heuer said. “When I came down here, I think that probably worked against us a little bit. Because as soon as I got here, I saw a lot more spread teams than I ever saw in Nebraska. “And now with more teams going to that, and the fact that we had better athletes the last few seasons, we had to basically switch some things up,” he added. Coach Doug Oberle won three state titles and earned a runner-up in his first 10 seasons as head coach, including an undefeated year in 2015. In ’16, the Knights had a very inexperienced squad and slipped back to 5-4 and narrowly missed the postseason, which ended the team’s run of 14 straight playoff berths. Victoria averaged 40.2 points a contest, seventh-best in Oberle’s tenure. The defense permitted 31.6 points a game, a huge jump from 9.5 points permitted the fall prior. It marked the worst scoring defense under Oberle. A revamped defense led to a 34-8 road win versus Central Prairie League rival Central Plains, then ranked No. 1 in Eight-Man, Division I.
Oberle labeled the performance a “complete game defensively” against the Oilers’ bevy of skill players. The contest started Friday and was halted because of lightning. It concluded Saturday, the first time Oberle had encountered playing a contest in two days. Victoria moved to No. 5 the latest Kpreps Division I rankings this week. Last season, Central Plains defeated Victoria, 48-22. Oiler all-state wide receiver Alex Barton had nine catches for 204 yards and two scores. This season, the Knights outgained the Oilers, 361-165, and limited Barton to four catches for 33 yards. The Oilers used two quarterbacks with Ellinwood transfer Myles Menges and Devin Ryan, the starter last year. Victoria was aware of the possibility they might use both quarterbacks. Oberle labeled several keys to strong defense: doing your job, being alignment sound, and having good technique. Victoria has 27 players and five seniors, all returning starters. Senior linebacker Cole Schmidtberger recorded a team-high 11 tackles, while senior linebacker Cooper Pfanenstiel, a three-year starter, recorded six. Senior defensive end Lucas Taylor tallied eight, including a sack. Senior nose guard Wyatt Engel had seven. Offensively, senior quarterback Collin Kisner and Pfanenstiel, who combined for more than 1,900 rushing yards last season, tallied 33 carries for 225 yards and four rushing scores. Juniors Tyler Knoles and Walker Braun were solid at defensive back. Thomas More Prep quarterback David McFarland set a state mark with 648 passing yards in the Monarchs’ Week 1 loss, 32-27, at Abilene. He completed 41 of 63 passes for four scores and two interceptions. Cauley believed McFarland’s yardage total was more than TMP threw for all of 2016. The Monarchs returned senior running back Gavin Schumacher, but Cauley said Schumacher had “no room at all” to run Friday. Senior Creighton Renz led the Monarchs with 13 catches for 224 yards and two scores. “David was hitting the short stuff, and that allowed him to get that intermediate stuff, which opened up the long stuff later,” Cauley said. The roots of the performance came from several places. Cauley, a U.S. Army veteran, came to Hays after he served as the head coach at Moanalua, Hawaii. In Hawaii, Cauley had a quarterback who broke the all-time state record with 556 yards in one contest. After Cauley left the Army and before Hawaii, he worked as assistant for his brother, Rick Cauley, back home in Alabama. Rick Cauley is long known for his work with the spread offense, especially from ideas by current college coaches Rich Rodriguez (Arizona) and Dana Holgorsen (West Virginia). Earlier in his career, Rodriguez served a long stint as West Virginia’s coach. “Our offense came originally from Rich Rodriguez,” Cauley said. Holgorsen was Jason Cauley’s offensive coordinator at Mississippi College. Holgorsen learned his offense at Valdosta State from Hal Mumme, one of the gurus of the Air Raid offense. Holgorsen was at Valdosta State from ’93-95 and Mississippi College from ’96-98. “I have tried to take some of Dana Holgorsen’s stuff that I learned at Mississippi College, and integrate it – just the passing concept-wise, not the run game,” Cauley said. Last season, the Monarchs averaged 18.4 points a contest, up from 12.6 two years ago. TMP is 0-9, 1-8 and 2-7 the last three falls. McFarland was hurt on the fifth play of last year’s opener against Abilene. He started at free safety and made four tackles before the injury. McFarland is the son of veteran TMP girls’ basketball coach Rose McFarland. She has led the Monarchs to back-to-back Class 3A Final Four showings. Rose McFarland, a girls’ basketball coach for more than 25 seasons, has battled cancer for several years while producing one of the state’s top basketball programs. When Cauley first came to Hays, he stayed with a McFarland family friend.